Darling ranch home with hardwood floors, updated kitchen & bathroom and first floor family room which exits to a large entertainment size deck. The finished basement has a large family room, bar and panelled laundry/utility room. Seller says all appliances remain (range, refrigerator, dishwasher, washer and dryer). 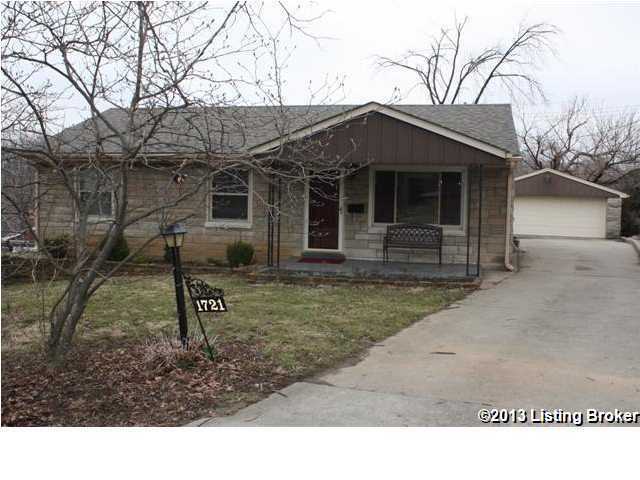 Seller is providing a one year 2-10 homeowners warranty for buyers peace of mind. Two car garage has door opener and keypad entry. Yard is fenced. Plantation blinds remain. Audubonvale is a subdivision within the city of Louisville, Kentucky. There are currently 0 Homes for Sale within Audubonvale, with asking prices ranging from $0 to $0. The average list price per square foot of the available inventory in Audubonvale is $0, which is the Louisville average of $157. The Average Sales price of all sold real estate in this subdivision for the past year is $170,400. Recent comparable homes have been selling for 97.50% of their asking price. Waterfront homes represent of the available Audubonvale inventory. The population of Louisville, according to the 2010 Census, is 597,337. The total number of households in the zip code of Audubonvale is 7,342, with an average household size for of 2.29 people. The total number of renter households within the zip code of 40213 is 2,937, which means that 60.00% of households in this zipcode are owner occupant households. 1721 Quarry Hill Rd, Louisville KY 40213 is a Home, with 3 bedrooms which is recently sold, it has 1,895 sqft, 60X109.25 sized lot, and 2 Car Garage,Detached,Entry Front parking. A comparable Other, has bedrooms and 0 baths, it was built in and is located at and for sale by its owner at $ 0. This home is located in the city of , in zip code , this County Other, it is in the Subdivision, and LYNNVIEW are nearby neighborhoods.